This guide will show you how to create your account and build a simple application on top of TrueVault. 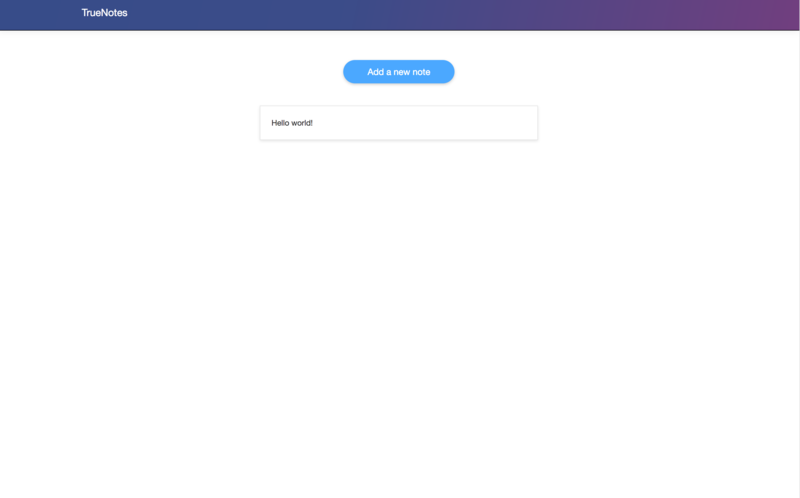 We will create TrueNotes, an app where you will be able to log in, create secure notes that are stored in TrueVault, and list your previously created notes. Note: This app is only supported with latest Chrome. First, you’ll need to create a TrueVault account. Tip: Every account starts out as a development account which means you should not store any Protected Health Information in TrueVault until you have activated your account and you have executed a Business Associate Agreement. You can email us (help@truevault.com) for a copy of the Business Associate Agreement before you sign up. 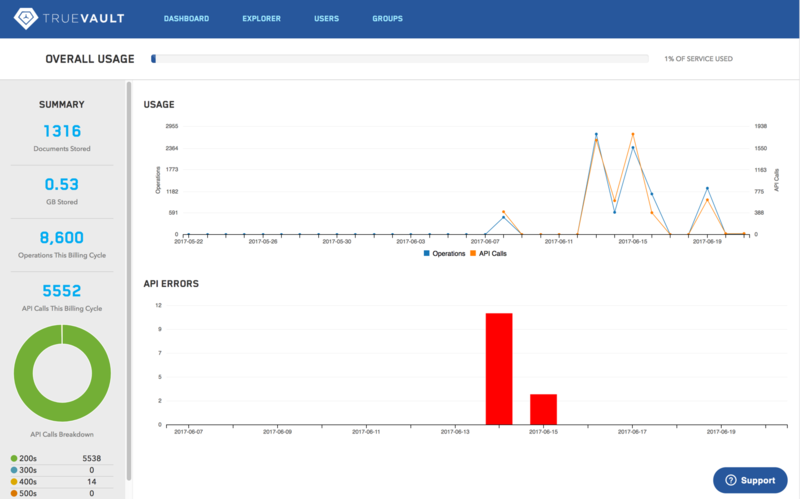 Once you create an account you will be taken to the Management Console Dashboard. Next, we will create a Vault to store notes. 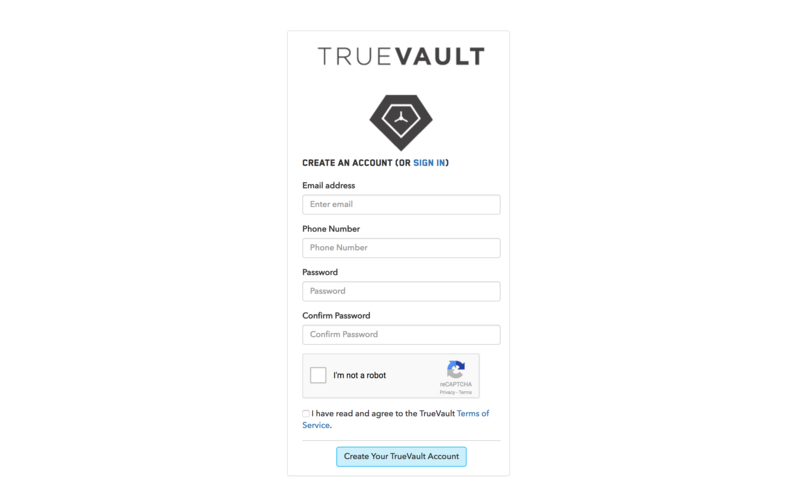 You can think of a Vault as a collection of TrueVault documents and BLOBs. Once logged in, click on the Explorer menu item on the top menu bar and then click the Create New Vault button in the bottom left. Name the Vault quickstart then click Save. 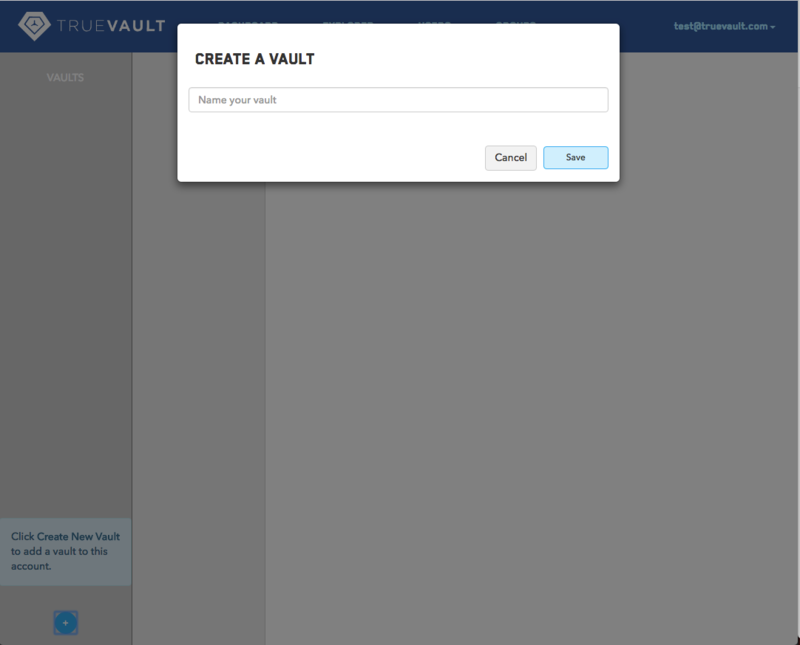 Now a Vault is created and it’s ready to store any JSON or BLOB objects. Next, we need to create a user in TrueVault. This is an end-user, an actual person who will log in and create notes with the application. Click on the Users menu item on the top menu bar then click the Add + button. Name the new user quickstart with a password then click Save. By default, Users don’t have permission to do anything in TrueVault. In order to grant Users access to data, we must first create a Group with a desired Group Policy and add the User to it. To do so, click the Groups menu item on the top menu bar, then click the Add + button in the left sidebar. 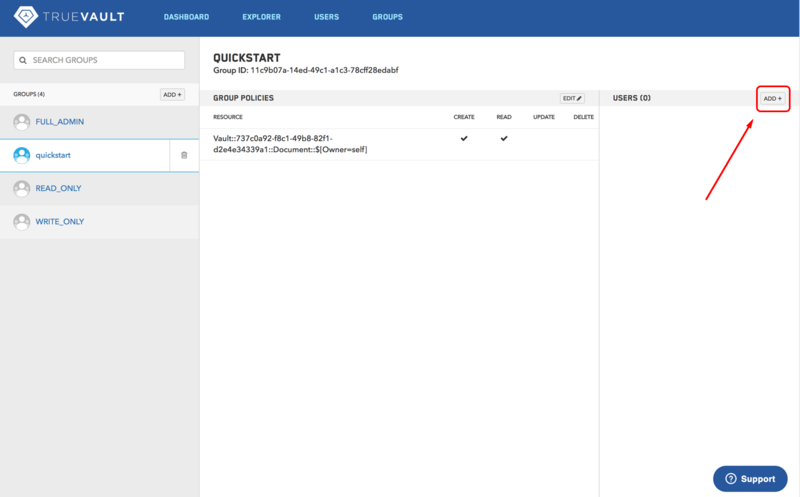 Name the group quickstart and add the policy with resource Vault::VAULT_ID::Document::$[Owner=self] (replace VAULT_ID with the ID of the Vault we created in step 2). Click the Create and Read Access buttons. 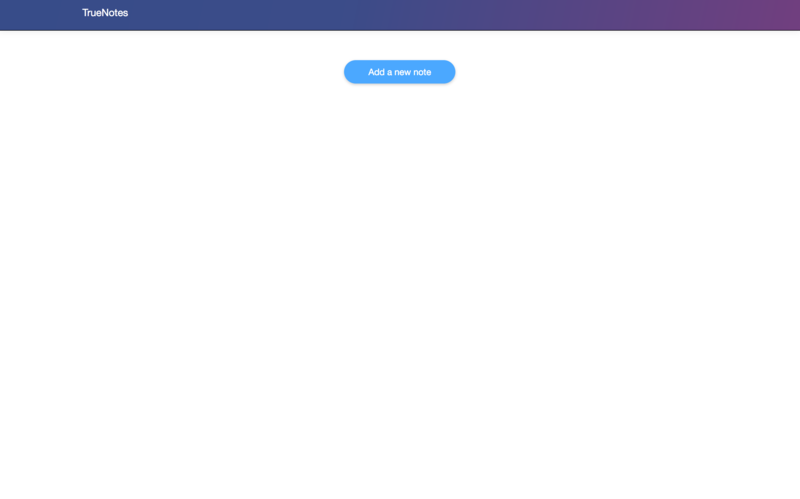 Now any user in this group will be able to create documents with themselves as the owner, and read any of their owned documents within that vault. In order for the user to be granted access, we need to add it to the group we created. 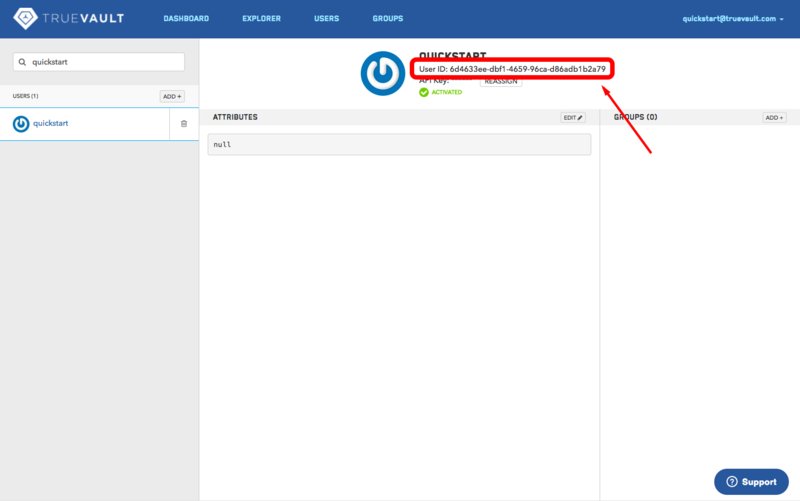 You can find the User’s ID by clicking on the quickstart user on the Users page and looking at the user info in the middle section. Copy that ID, navigate to the Groups page, click the quickstart group, and click the Add + button at the top of the right sidebar. Paste in the user ID and click Save to add the user to the group. 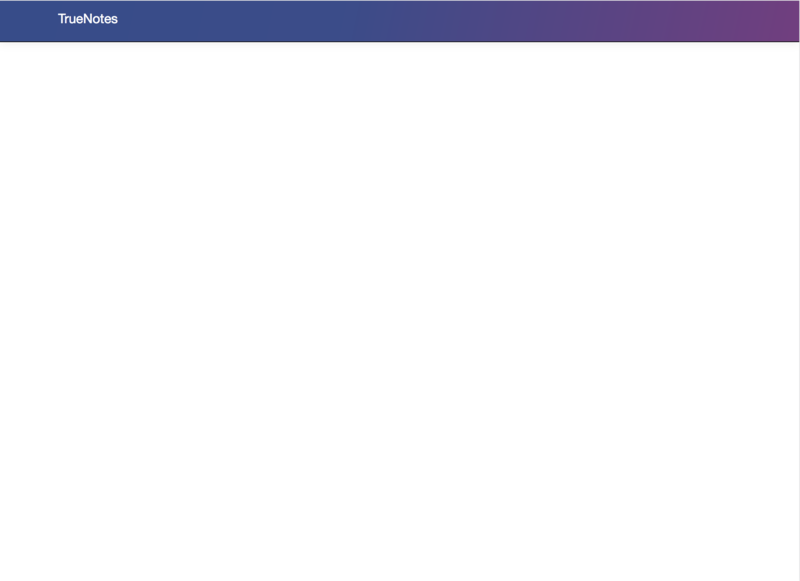 This skeleton only contains HTML, CSS, and Bootstrap, which we will build off of to create the full app. Before running the app, you will need to copy the tv-config.js.template file to tv-config.js and fill in you account ID and the ID of the vault you created previously. You can find your account ID by clicking your account username at the very right of the top navigation bar and clicking Account. At the top left of this account page you will see your account ID. Fill this in for TV_ACCOUNT_ID in tv-config.js. 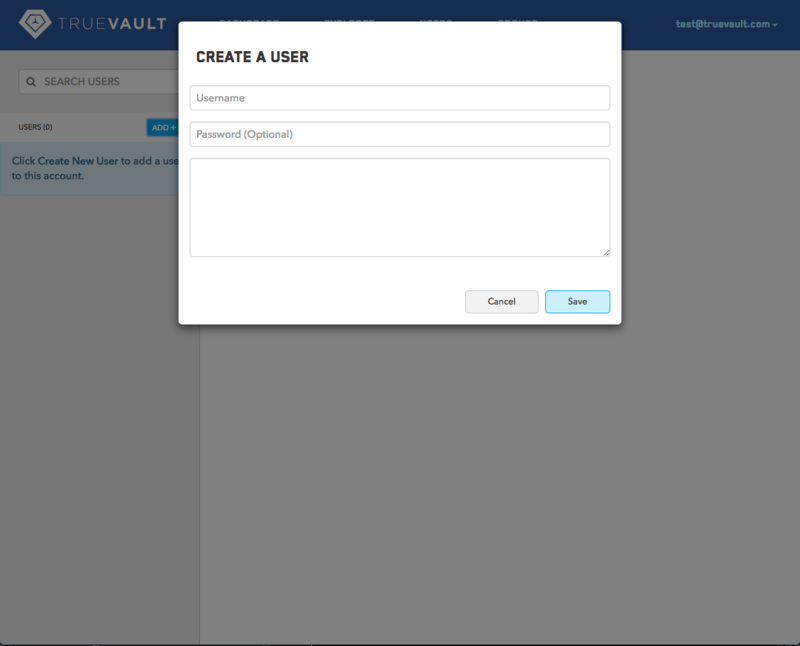 You can find the ID of the vault you created by going clicking the Explorer button on the top navigation bar, clicking the vault in the sidebar, and copying the UUID from the URI in your browser’s navigation bar. Fill this in for TV_VAULT_ID in tv-config.js. You can run the app by serving the root directory. An easy way of doing this if you have python installed is by running python -m SimpleHTTPServer in the root directory and navigating to localhost:8000 in a browser. You will need to refresh the page after making any changes to the code. At this point all you should see is the top navigation bar of the TrueNotes app. In order for our application to authenticate a user, we need to create a login form. 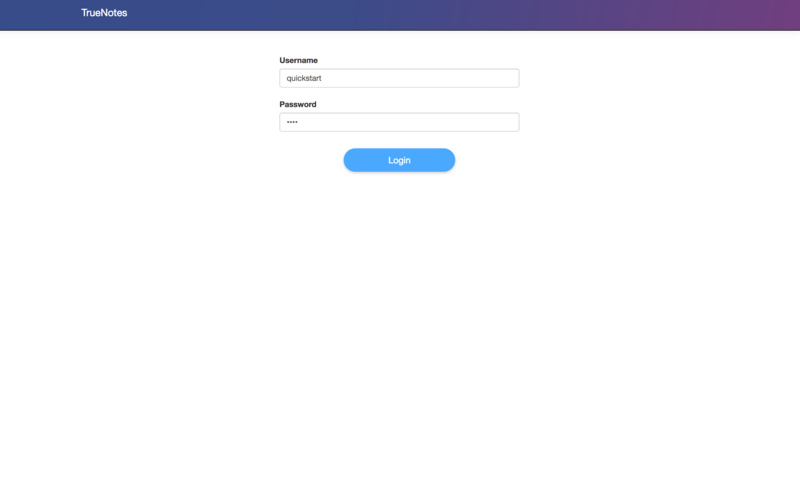 This will use the login endpoint in TrueVault, with which the end user will send a username and password and receive back a user access token. This user access token will be used to make subsequent TrueVault requests. If you open the Chrome console and log in with the quickstart user’s credentials, you should see a user access token logged to the console. We will use the tvClient object which saves this user access token to make all subsequent requests to TrueVault for this user. When we create a new note, we want to store it in the quickstart vault in TrueVault. 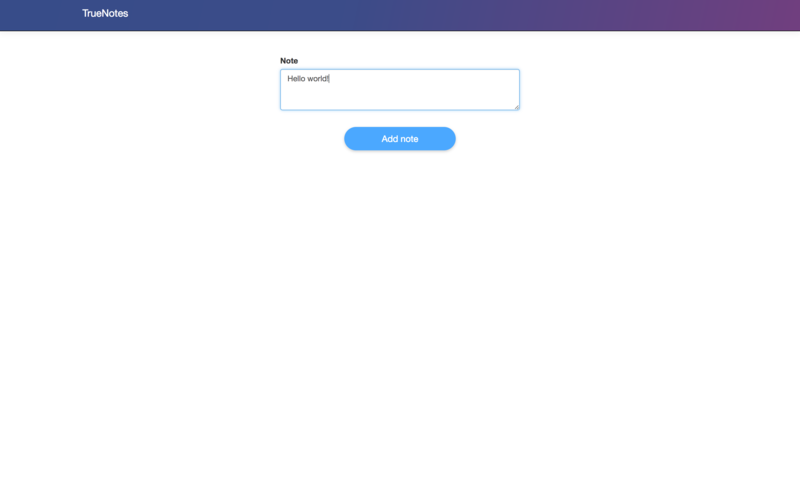 Let’s add a form submission handler to index.js that does just that. The user is able to make themselves the owner of a created document because they have Create permission on Vault::VAULT_ID::Document::$[Owner=self]. If the user tries creating a document with an owner_id other than their own, TrueVault will respond with an error message. Note: Clear the path and fragment in your browser url (so it just reads localhost:8000) when you reload. The simple state management in this quickstart app isn’t smart enough to redirect you back to login (and you’ll have to login each time you reload). When we load the #notes view, we need to make a request to TrueVault to list all of the vault’s note documents. Let’s add this TrueVault request to the #notes switch case. We call the document list endpoint from TrueVault and create note divs for each of them. The end user is able to list all the documents they own because they have Read permission on Vault::VAULT_ID::Document::$[Owner=self]. Note that they won’t be able to see any other user’s documents. This is a common example of how you can use TrueVault permissions to prevent users from accessing data they are not supposed to. To try out the entire flow of the app, change the url back to localhost:8000 and reload. You should be able to log in and create notes. As a bonus exercise, go back to the TrueVault Management Console and create another user, adding it to the same group. Try logging in as that user. The two users won’t be able to see each other’s notes (even if they requested them by id). We have completed our first application using TrueVault. It should look the exact same as the master branch of the truevault-quick-start repo we cloned. You can switch back to master by running git checkout master. By now you should have an understanding of the basics to creating an application using TrueVault. For more a more in-depth example application, check out our more advanced React Sample App which demonstrates a more complex and realistic application architecture. If you would like to learn more about how to build your project using TrueVault, please contact us at help@truevault.com or ask a question on StackOverflow with the tag truevault.